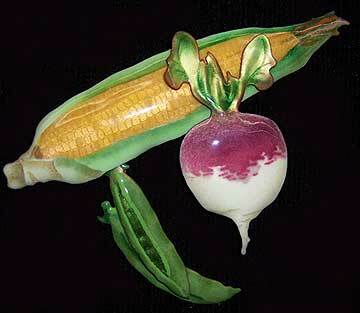 This is Bovano's "Corn, Peas, and Turnip" sculpture that was the first piece in the kitchen series. These pieces were usually mounted on a kitchen wall or over the doorway between kitchen and dining room. One customer, however, sent us a picture showing how she had mounted one on each of her kitchen cabinet doors. This piece is 7" tall by 9 1/2" wide. It is now fully retired and no longer being created. We have 1 available and ready for immediate shipment.